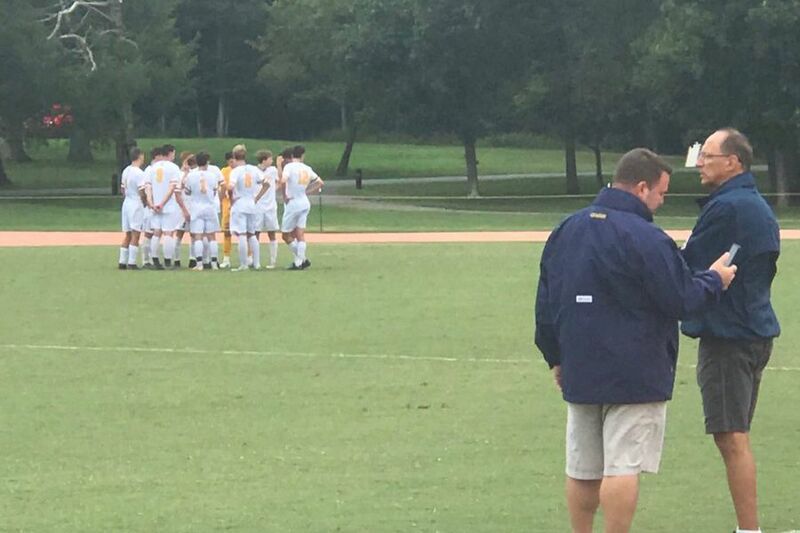 The Penn Charter boys’ soccer team held off Council Rock South, 3-1, on Monday. Bill Melnick netted three goals as the Penn Charter boys' soccer team held off Council Rock South, 3-1, on Monday. Sean Touey's first-half goal gave Abington a 1-0 decision over Central Bucks East. Ryan Foskey scored two goals as Boyertown cruised past Norristown, 6-0. Zach Stevenson recorded his first varsity goal in Methacton's 2-1 win over Owen J. Roberts. Trevor Rambo also scored for the Warriors, who ended with 16 shots. Riley Regan scored the lone goal in Villa Joseph Marie's 1-0 victory over Villa Maria. Alexandria Chalmers and Olivia Gentile had two goals apiece in Conwell-Egan's 7-0 rout of Bonner-Prendergast. Hannah Havrilla scored on a penalty stroke with 37 seconds left in the first half to give Wissahickon a 1-0 win over Upper Moreland. Meghan Reilly recorded the shutout, making three saves. Archbishop Carroll got two goals apiece from Alex Almonte, Megan Curray, Katie LaBella, and Maeve Riehman in a 10-0 triumph over Little Flower. The Patriots improved to 5-0 in the Catholic League. Ava Borkowski had three goals as Plymouth Whitemarsh rolled to an 8-0 win over Hatboro-Horsham. Kennedy Reardon added two goals for the Colonials, who improved to 7-0 in Suburban One American Conference action. Norristown's Josh and Caleb Ryan finished 1-2 in the Pioneer Athletic Conference's Individual Golf Championships at Gilbertsville Golf Club. Josh shot a 70 and Caleb finished at even-par 71. Methacton senior Dylan Lasecki and junior Nick Martin both tied for third place.